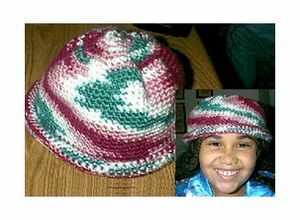 Warm, cosy, and economical crochet hat to make with just one skein of yarn. Crown- ch 3 and join with a sl st in first ch to form ring. Rnd 1 – ch 1, 6 sc in ring, ch 1 and mark with a saftey pin. Rnd 2-2 sc in each single crochet around, end sl st to beg ch. Ch 1 mark. Rnd 3-*1 sc in the next sc, 2 sc, in next sc: rep from * around, end sl st to beg ch. ch 1 mark. Rnd 4- *1 sc in each of the next 2 sc, 2 sc in next sc, rep from* around, end sl st to beg ch. ch 1 mark. Rnd 5- *1 sc in each of the next 3 sc, 2 sc in next sc, rep from* around, end sl st to beg ch, ch 1 mark. Rnd 6- * 1 sc in each of the next 4 sc, 2 sc in the next sc, rep from* around, end sl st to beg ch, ch 1 mark. Rnd 7- * 1 sc in each of the next 5 sc, 2 sc in next sc, rep from* around, end sl st to beg ch, ch 1 mark. Rnds 9-23 Work a sc in each sc around, sl st in beg ch, ch 1 mark. Rnd 24-* 1 sc in each of the next 7 sc, 2 sc in the next sc, rep from*around. end sl st to beg ch, ch 1 mark. Rnds 25- 35 work a sc in each sc around, sl st in beg ch, ch 1 mark repeat to last row, sl st in beg chain, fasten off.